Charlyne Amanda Yi (born January 4, 1986) is an American actress, comedian, musician and writer. Her performances include music, magic, games, and often audience participation. Her screenwriting debut, the feature film Paper Heart, won the Waldo Salt Screenwriting Award at the 2009 Sundance Film Festival. She is also known for her role as Dr. Chi Park on the Fox medical drama House, the voice of every Ruby on the Cartoon Network animated series Steven Universe, the voice of Chloe Park on We Bare Bears and the voice of Alice on Summer Camp Island. 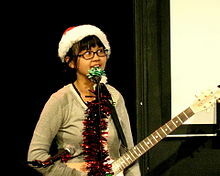 Charlyne Yi was born in Los Angeles, California. Her mother, a native of the Philippines, is of Filipino and Spanish descent, and her father is of Chinese Mexican, Native-Mexican, Korean, Irish, German, French, and Native American ancestry. She attended the University of California, Riverside before leaving to pursue a full-time career in comedy. She had an early interest in performing when she attended Bloomington High School and was involved in theatre. Yi began by performing in Bloomington, California. After high school, she has performed shows in Los Angeles at The Steve Allen Theater, and The Upright Citizens Brigade Theatre. In 2005 and 2006, she performed in the New York Comedy Festival, and in 2007 HBO's U.S. Comedy Arts Festival in Aspen, Colorado. Yi's film debut was in Judd Apatow's 2007 film, Knocked Up. In 2008, Yi performed as part of the Apatow for Destruction Live comedy show at Montreal's Just For Laughs Festival. In the 2009 film Paper Heart, a "hybrid documentary" which Yi executive produced in addition to co-writing, she starred as a fictional version of herself, along with Michael Cera. Yi was chosen as one of Venus Zine's "25 under 25" women for 2009. She has also appeared alongside Saturday Night Live cast member Fred Armisen in the music video for the song "Rabbit Habits" by Philadelphia experimental band Man Man. Yi and Paul Rust formed the band The Glass Beef. The duo share one electric guitar and both sing lead vocals. In 2006, they released their debut album, The Farewell Album, produced by John Spiker, bassist of Tenacious D.
Yi was featured in the video "Song Away" by Hockey. She is currently in the band Sacred Destinies. In January 2010, Yi performed a duet about break-up lines (the opposite of pick-up lines) with Demetri Martin on the episode "2" for the Comedy Central sketch series Important Things with Demetri Martin. However, the duet was cut from the final edit of the episode. . She also appeared in Lucifer season 3 episode 25 as the angel of death. From October 2011 to May 2012, Yi starred in Fox's series House as Dr. Chi Park, a young doctor with anger-management issues. Yi has been involved with Oxfam America since 2010, working to raise awareness about poverty and hunger around the world. Yi started the non-profit Caring is Cool in 2011, and hosted a benefit show to raise money for the organization. 2006 Help Me Help You Charlyne 1 episode, "The Sheriff"
2007 30 Rock Grace Park 1 episode, "The C Word"
Cold Case Dorky Girl 1 episode, "Stand Up and Holler"
2008 Miss Guided Karey 1 episode, "Pool Party"
2011 Love Bites Adult store cashier Episodes: Unaired Pilot, "Firsts"
2011 Yo Gabba Gabba! Edith 1 episode, Episode 55 "Treasure"
2015 Looking Cashier Season 2, episode 7, "Looking for a Plot"
Jane the Virgin Angela Episode: "Chapter Thirty-Nine"
Future-Worm! Zoe (voice) Episode: "Bug vs. the Babysitter"
2017 Twin Peaks Ruby Episode: "Part 15"
Danger & Eggs Layla (voice) Episode: "Keep Off the Grass/Pennies"
Room 104 Gracie Episode: "FOMO"
2018 Lucifer Ray-Ray / Azrael Episode: "Boo Normal"
^ "Charlyne Amanda Yi, Born 01/04/1986 in California". CaliforniaBirthIndex.org. ^ Saba, Michael (30 September 2009). "Charlyne Yi: Geek Love". Paste. ^ a b c d Boyd, Betsy (2007-02-26). "Charlyne Yi: 10 Comics to Watch". Variety. Retrieved 2007-04-24. ^ Boyd, Betsy (27 February 2007). "10 Comics to Watch - Charlyne Yi". Variety.com. Archived from the original on 2 May 2014. ^ Chang, Elysha (24 October 2017). "David Cross, Charlyne Yi, and the Luxury of Forgetting". gq.com. ^ Keepnews, Peter (2005-11-03). "Upstart Comedians Goofing on Andy". The New York Times. Retrieved 2007-04-24. ^ "Just For Laughs highlights". Variety. 2008-07-10. ^ Venus Zine Staff (March 1, 2009). "25 under 25". Venus Zine. Archived from the original on March 6, 2009. Retrieved February 16, 2017. Funny lady Charlyne Yi's name may not sound familiar, but you have seen her in movies and TV shows like Knocked Up and Miss Guided, and now in Paper Heart, a half-documentary, half-narrative starring Yi's real-life love interest Michael Cera about the meaning of love. Aww. ^ "Song Away by Hockey with Charlyne Yi". ^ "Charlyne Yi as Dr. Chi Park on House". channelAPA.com. November 1, 2011. Retrieved November 9, 2011. ^ Petski, Denise (May 21, 2018). "'Lucifer': Fox Sets Airdate For Two Bonus Episodes Of Canceled Series". Deadline Hollywood.